Taranaki New Zealand is a region in the coastal west side of the North Island of NZ. The region is named after Mount Taranaki, a very dominant feature in the middle of the landscape that was named Taranaki by Maori. 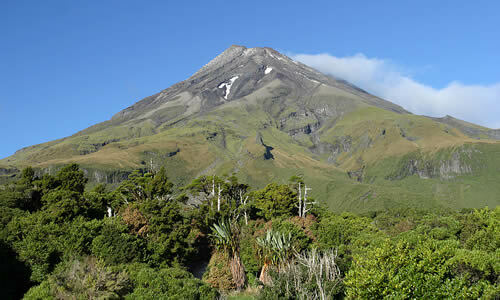 The mountain was later given a second name by Captain James Cook, ‘Mount Egmont’. For this article I am going to use its first name, ‘Mount Taranaki’. Egmont National Park surrounds Mount Taranaki whose height is the second highest of the mountain peaks in the North Island, and whose shape is conical. New Plymouth is the main city with other towns being Eltham, Inglewood, Hawera, Opunake, Stratford, and Waitara. Most of Taranaki regions population lives in the New Plymouth area. The Taranaki region is on a peninsula jutting out into the Tasman Sea. Due to exposure to winds from the north, west, and south, surfing and windsurfing sports are considered to be excellent on this part of the New Zealand coast. Follow the Surf Highway SH45 from New Plymouth to Hawera to experience the surf!